I reviewed Chaos Walking Book 1 THE KNIFE OF NEVER LETTING GO in 2008 and Chaos Walking Book 2 THE ASK AND THE ANSWER earlier today. So far, the series has been spectacular, and a must-read for fans of thought-provoking dystopian fiction. 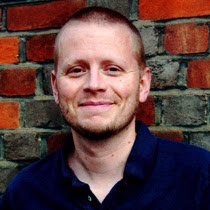 I'm thrilled that the author, Patrick Ness, is joining us for Dystopian February today. Welcome Patrick! What are some of your favorite dystopian novels, if any? Did they influence you at all in the writing of The Chaos Walking trilogy? It's odd to think of it as dystopian, really, but David Foster Wallace's "Infinite Jest" is one of my favorite novels ever and is, in fact, about a messy future. As for influential, there's actually a film that I saw years and years ago as barely a teenager called "This Quiet Earth" about a man who ends up alone on the planet. The imagery of the deserted cities really stayed with me (no idea if the film is any good, it's been so long) but that solitude shows up a lot in the trilogy, even if it's not directly about being the last man alive. You tackle a lot of issues so far in your trilogy – complete loss of privacy, extreme gender roles, information control – Is this where you fear our own society is heading? Actually, I don't think dystopian novels are really ever about the future, I think they're about the present. Many of these problems, I think, are problems right now, and the books re-contextualize them to explore them. But golly, loss of privacy, information control, that's today's headlines! Yikes. The gender roles were more a way of exploring my theory about how badly we are as a species at handling difference. If something is different, it's either better (in which case we need to destroy it) or worse (in which case we need to exploit it). That was more a plea to accept difference as merely difference. We get into so much trouble because we struggle with that. Why do you think dystopian fiction has become so popular recently? What’s the attraction? Lots of reasons, I think. Terrorism physically reaching America, the strain of apocalypse in many popular religions, fear of new technologies, but also I think, the way the internet has turned into a great outlet for outrage and has made it oddly harder to respectfully disagree. Someone you disagree with isn't just wrong, they're the biggest idiot ever lived. Know what I mean? In those circumstances, it's hard not to worry about things coming apart, even if the facts are that we're mostly fine. It's a shame, really, and I hate how politicians (among others) play so heavily on manufactured discontent. It's enough to dent even the brightest optimist! In addition to writing books, you also review books for The Guardian. Were there any books which were really difficult for you to review? Not really. I'm naive enough, maybe, to think that it really is just my opinion and that if I write a negative review, then the writer is bound to get other positives. But in all honesty, I only give really negative reviews if I think the writer has been lazy or cynical. It's such a privilege to write a book that to take it for granted really annoys me. Mostly, though, it's a chance to celebrate books and tell people they should read them. Good fun. What is your favorite part about being an American abroad? I know what you mean - we don't have decent Mexican cuisine in Germany either. Thanks Patrick! Read more of Patrick's thoughts at his online diary. So thanks to Candlewick, I have copies of the first two books to give away to one lucky commenter. Here's your chance to catch up with the series before the release of book 3 MONSTERS OF MEN which promises to be explosive. Just say something meaningful about Patrick's interview in the comments and you're entered to win. As always, I will give you one extra entry for posting a link on your blog (sidebar is fine) or on twitter. This contest is open to residents of the US and Canada until 11:59 pm CST on March 8th. I totally agreed with what Patrick said about reviewing books! Actually, I don't think dystopian novels are really ever about the future, I think they're about the present. This is such a good point. And I can definitely see it in these books. Lovely giveaway! I love these books with a bone-crushing passion. I absolutely can't wait for the third book, and I'd love to be entered in the contest. I love Patrick's thought that dystopian novels are about the present as opposed to the future. It's fascinating to think about what could happen in the future if we let our present get out of control. Thanks for the interview! I also read (in Narrating Utopia) that the appeal of dystopias is related to their representing the logical outcome of current conditions unless something can be done to stop it. Given how difficult it is to effect even the most minute improvements in the legislature, it doesn't seem like an unreasonable fear. Although I got both vol 1 and 2 from the library, I would love to own my own copies so I can reread them before vol 3! I agree that dystopians are just an exagerated look at the way our society is today. Like Hunger Games for example ridicules the way our society is very self-distructive, as well ad how we watch people hurt each other and do nothing to stop it, and sometimes go as far as to enjoy watching it. I do agree with Patrick on dystopian novels not really about the future. I've always thought they were a parallel world to us. I think the appeal for me is not knowing what the other side of the world holds and these novels implant ideas of what it could be like. Not meaningful at all, well maybe to me since I love food, but if poor sad and deprived people hold up Taco Bell as your standard of Mexican food, then you have rendered me speechless. I wouldn't have been so appalled had you said Chipotle, which would still; be pretty sad. Lenore, Dos Caminos is in our future when you come to NYC. Wow, what a terrific giveaway! I've been meaning to read these books for awhile now. I really love what Patrick said about it being a privilege to write a book---so true! And I agree with much of what he says about the popularity of dystopian fiction, but I find that, beyond the horrific natures of such dystopias, there's also a sense of hope; the idea that no matter how terrible things get, humans (even in reduced numbers) will still survive. In some cases, this message is implicit instead of explicit, but it's still there. What an intriguing interview. I loved Patrick's answers. Especially his thoughts on dystopia being more about the present than the future. I have to agree the internet is more violate these days. It's far too easy to judge and harass without ever accounting for the abuse given toward a face they can't see. Mob mentally is more focused with an easier way to feed the insanity. If humans were truly given another chance to start over, do you believe it's truly possible for them to learn from their mistakes? I'm not sure Taco Bell is what I'd miss abroad. Here in Texas we have the real stuff. Which makes me think BBQ might be what I'd miss most. Oh good lord, I LOVE these books. They took over my brain! Great interview! I especially liked the bit about reviewing for The Guardian, because I agree with Patrick's take: someone's going to spend money and time on what you're putting out there; you're getting to create something that is completely you and share it with people, let them connect to you -- that shouldn't be taken for granted, and it shouldn't be just slopped on the page and then dismissed. Drives me nuts. I don't know what I would do with out Mexican food. Thank god I can cook, but still. Oh! Maybe the terror in our present is spam! Poor Lenore! I actually have curtailed some of my dreams of relocation because of the lack of Mexican food. I was also shocked to find out recently that our Seattle teriyaki abundance is only a local phenomenon. Maybe my future is in opening a good authentic Mexican restaurant in England. I would love to win these books. I have yet to read them but always hear rave reviews. I agree with what he says about dystopia really being about the present and not the future. Really what it's doing is looking at what's happening now and taking it a few steps further. That can be scary sometimes! Great interview. You do them well and I've given this blog an award. You will find the award on my blog. I have Infinite Jest on my shelf but it's just to big of a commitment right now. Have you seen how big that thing is?! This was a really fun interview to read, especially since I loved the first two books so much. I really liked what Patrick had to say about several things, but especially the parts about politicians manufacturing discontent, and dystopian fiction highlighting issues that we have today. I really enjoyed reading Patrick's interview here. I'm going to read my first dystopian novel now for sure! I think Patrick Ness' response to your question about why dystopian fiction has become so popular right now is totally on point but what I really loved about your interview with him is that he said "Infinite Jest" by David Foster Wallace is one of his favorite books! I was thrilled to read it since I loved that book! I agree with him so about the internet being like an outlet for outrage. Of course there are many happy and positive discussions to be found, but the diary-style loose-lipped ejection of dramatics is staggering. Cool blog you got here. I'd like to read a bit more concerning that matter. Thank you for sharing that info. Great interview! I definitely agree that dystopias are less about the future than about our problems right now. By re-contextualizing the issues, dystopias can approach them in new ways, and by showing the worst-case scenarios, dystopias can offer warnings that spur readers to action. I look forward to reading The Ask and the Answer and Monsters of Men, as The Knife of Never Letting Go left me wanting more. I'm really enjoying Dystopian February! Ah, yes - Taco Bell never really made the international leap, did it? I find that whenever I travel or find myself living in a foreign place, those little traces of homesickness are easily cured by McDonald's french fries. Frightening but TRUE. I like Mr. Ness' take on why dystopias are so successful right now - and I think there's an element of truth to those thoughts. Great stuff! Wow! I am mighty impressed that you were able to interview the amazing Patrick Ness. That is fab! He reviews for The Guardian. Good to know. Patrick, if you're checking this, please review When I Was Joe by Keren David. It is the most awesome book and it deserves positive media attention. Sorry for hijacking your comments Lenore but I must get people reading that book. I completely agree with Patrick about dystopian novels really being about the present...they seem to be based out of our present fears or threats...they are what we fear in many ways...however they are fascinating to read for some of the same reasons. Thanks for the giveaway...I would love a copy to review on my blog! Is it just me or did any other Brit bloggers minds jump to the famous 'Broken Britain' slogan of DC when Patrick talked about politicians? I feel the same way about giving really bad reviews. If I think a writer has been lazy I get annoyed that they stole my time, if they're cynical (see Broken Britain type ideas again) I get mad. I had no idea he reviewed for The Guardian, must check some of his reviews out online. "Actually, I don't think dystopian novels are really ever about the future, I think they're about the present." Exactly. So many authors over time have managed to sneak in social commentary with a dystopian or futuristic setting. I think, in a way, that's what makes it so good. We imagine ourselves as the hero. Awesome interview. Please enter me to win the books. I was particularly intrigued by what Patrick said about humans not handling difference very well. In a weird way, it reminds me of an old episode of the Twilight Zone (yes, I'm one of "those people"), in which everyone went through plastic surgery at a certain age, being literally modeled afer a preconceived design--kind of like picking out a cookie-cutter house or a car out of a magazine. That, to me, is the most terrifying vision of the future: being forced to become homogeneous, completely without a unique personality or relevent thoughts. Nice story as for me. I'd like to read more concerning that matter. Thnx for posting that data. Great story you got here. It would be great to read more about that theme. Thanx for giving this material. Great interview! I added The Chaos Walking trilogy to my to-read list. I'm on a huge dystopian kick lately. I haven't read these books but I have heard and read so many wonderful things about them. I agree with what he said about celebrating our differences rather than trying to destroy or control those things that are different. There would be so many less problems in the world if everyone just realized that we were not clones and that people are different from each other. It might get rid of the violence and prejudice we still see so much of today. Don't enter me for the giveaway - I already have the first two books - but I just wanted to say, GOD, I missed Mexican food SO MUCH when I spent a year in England. I'm from Louisiana and I was expecting to miss crawfish and jambalaya and stuff, but I could more or less make jambalaya for myself if my family sent me a mix, so mainly I was dying for some Mexican. When I came home I ate Mexican for like four days in a row. I loved reading this interview, it was great! Patrick, I don't know how you live without Mexican food! I love it! But I really like your approach to your abroad lifestyle as just the home for now. That is great. I have heard many great things about your books and cannot wait to read them! Thank you for the wonderful interview with Patrick Ness & thanks to Patrick for taking the time to provide such illuminating indepth answers. Thanks for introducing me to Patrick and his writing! I love discovering new (to me) authors & his CHAOS WALKING books sound excellent. PS - I posted this on my blog for Fri, 5 pm EST. Ok, by far my favorite part is dystopia being about the now!!! I love that idea. I'm a fan of dystopias because underneath I feel the same way. He also makes me rethink my reviews. I know it's just my opinion. I need to work more on the celebration part. Thanks for the interview. My students love Ness! Have not heard of this trilogy or author but definitely will correct that. Hope I get a chance at the books but will run some down either way. Love the fact that all three will be out by fall as I hate to start a series or trilogy till I've got them all. I have never heard of this author before. Always on the look out for good new authors. These sound like some interesting books. Dystopians are a hard genre too write. Some authors make things way to out there and comes off sounding like fiction and it takes away from the story. I thought his whole thought on life aboard was rather funny. Fabulous interview!!! (no need to enter me in contest, I own the books). I loved all Patrick's answers, especially the one to the second question. I could rant, er um talk reasonably, on that subject all day. I can't say how much I enjoyed "The Knife of Never Letting Go" and "The Ask and the Answer" (and I'd be thrilled to own both!). One of the things that really stuck out to me was the idea that, in today's society, we so rarely invite dialogue on issues about which we disagree. As Ness mentioned, it's so difficult to "respectfully disagree." His books explore the severe consequences of that really well. Wow! Thanks for the great interview. I am so in love with this series - I love how Todd and Viola's relationship is developing and I seriously cannot wait for book three! No need to enter me, darling. Clearly, though, I need to catch up on my dystopic fiction 'cause this is a new-to-me series! I've got this posted at Win a Book. Thanks, as always, for the e-mail. I can't wait to see what other dystopian goodies you've got. I loved the whole interview! :) I hear that there IS a Taco Bell in England--it's on the U.S. Army base. So if he sneaks in there, he could get some. ;) Also, I liked how he admitted that he has no idea if the movie he saw as a kid is any good because it's been so long, and yet that imagery really captivated him, and has stayed with him to this day. The potential dystopian future is a frightening thought. Margaret Atwood's The Handmaid's Tale is one such frightening future. I agree that fear of new technologies has fueled the belief of a dystopian future. I loved his thoughts on writing book reviews. Lazy writing definitely warrants a negative review. A book that may not your cup of tea does not automatically equal a negative review. Thanks for the giveaway! Very smart review! I like that he proposes that dystopian literature is not about our future, but our present. I hadn't thought if that before, but in most instances I believe that can be true. I really would be interested in reading his books and seeing how he envisions the world around him. Please enter me in your very generous giveaway, and thanks for hosting it!! Ooh, I'm very interested in these books now that I've read this interview! I especially liked Patrick's comments about how our species is so bad at handling difference. Please enter me in the giveaway! It was a very good interview with Ness. I think he was bang-on with the reason dystopian literature is so "in" right now. It's always been that glimpse at the present from a very stark viewpoint. Often makes me wonder how people from 100-150 years ago would react to the world at large today--not so much the technological, but the cultural differences. please enter me to win thise fabulous giveaway=book. Hi Patrick, I have not read any of your books but I loved the line where you said "Many of these problems, I think, are problems right now, and the books re-contextualize them to explore them. But golly, loss of privacy, information control, that's today's news". Yes, we are losing our privacy in almost every way. If it isn't the govt, it is criminals. It is scary.. I feel the same way as Patrick when it comes to reviewing books,and find it annoying that some people seem to trash a book just for the sake of venting or hearing themselves speak. And oddly (or maybe not) this ties in with what he said about the popularity of dystopian novels: people can over-exaggerate their emotional reactions and vitriol when online, and I think that carries over into not just their opinions of the books they don't like, but also into a name-calling of anyone who disagrees. Great interview! I've never read dystopian fiction before but after reading this I am definitely interested. Oh whoaa. I never thought of dystopian lit as addressing current issues before, but what Patrick said about that makes a lot of sense! I, too, don't see dystopian lit as actual predictions for what might happen in the future--they're more like warnings so we can think about what we're doing now that's bad. I've linked to this giveaway in my sidebar! Thanks for this (and for all of Dystopian February)! Patrick's comment about dystopias being about the present rather than the future is spot-on, and connects with Diana Peterfreund's line about dystopias being an experiment -- what happens if we keep making this particular choice? I blogged about this some and probably will again; I don't seem to be able to shut up about dystopias, either. I not sure Patrick's right about a greater interest in dystopias due to terrorism or whatever. I think there are always problems in the world, and it often seems like the world is on the verge of disaster (consider various books written during the Cold War, for example). I think book trends are often more influenced by one book that becomes really popular. Is there a social reason for all the vampire books out there lately? No, it's pretty clearly just due to the success of Twilight. Likewise, I think The Hunger Games is responsible for a lot of the YA dystopias out there, or at least for the fact that they're getting good publicity and being read/talked about more often. I think he's right about dystopian novels reflecting the present more than the future. I also think the overcrowding of the world can make dystopian fantasies an almost attractive alternative. I agree with Patrick's reasoning why dystopian novels are so popular these days. The politicians are ruining everything and the outlook is bleak. Wow dystopian books? Count me in! I love Patrick's attitude about reviewing books. I have fallen in love with dystopian novels and his theories on their populatiry are interesting and I can see where they have some basis. Thanks for the contest! I like the fact that you don't shy away from meaningful and sometimes difficult subjects. It's interesting he's a reviewer as well as a writer. It's really cool that he's lived in so many places. That probably influences his writing a lot. Cool interview and thanks for hosting this giveaway! I totally relate to that lack of Mexican food comment as well (Germany, of course, same as you, not England, but it's an epidemic all over Europe! ), minus the taco bell part (I'll never miss taco bell, that shouldn't even be in the same SENTENCE as Mexican). Oh wow, I loved what he said about how he thinks dystopian is really more about the present than the future. I never really looked at it that way before, but you know, he's right. Though I still feel it shows our future as well. Terrific interview and I'm really excited to read his books now. Please enter me. This was quite interesting. On the reviewing of books: there are some books that I don't enjoy. They just don't give me what others do. But when reviewing them, be it online or in person with a friend, I try to be sure to highlight the attributes and merely say "It isn't my usual style, but *insertpositiveattribute* was well done." I don't ever want to deter someone completely from reading a book even if I did not like it. They may enjoy it immensely. It is unfair to rob them of that pleasure. As for dystopian literature..yes it can definitely be compared to current conditions.